Select date range to view. Filter by Activity Type, Course, Workout Type, Equipment or Distance. Click on the data and get details of the workout, notes, pace variations, equipment, course, or workout details. See total distance and workout time total, per day and per week average for the selected period. 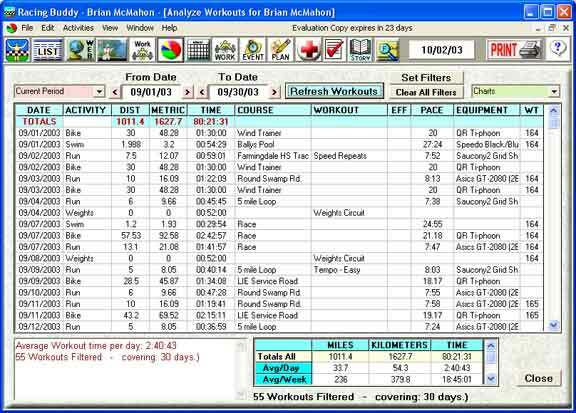 These totals are also displayed for run, bike, swim, weights and other activities. Print out your workouts and graphs. Charts represent the date as filtered. Click on the bars and pie pieces and get details of that piece. For single month, pies and bars represent days instead of months.